Laptop Fuel Cells Ready Soon? "Statistics published Tuesday by IDC show that industrywide notebook shipments rose by 22.4 percent globally on a year-over-year basis during the second quarter and grew by 1.5 percent from the first quarter. Meanwhile, shipments in the United States grew by 18 percent year over year and by 8 percent sequentially, IDC said." The article notes that Apple has regained fifth place in the US portable market with 7 percent of domestic laptop sales. "...laptops are expected to continue to gain ground. Notebooks represented nearly 27 percent of all PCs sold both worldwide and in the United States during the second quarter, up from about 25 percent for both markets during the first quarter. Thanks to sales seen of late, the portable PC category is well on its way to eclipsing the 30 percent mark and should reach 35 percent of PC sales in the U.S. market by 2007, IDC said." The G3 WallStreet PowerBook is still a way cool computer, but they're getting along in years and tend to get scratched up. The rubberized back of the WallStreet is an appliqué in aluminum plate, so with about 45 minutes of work with a Dremel tool, you can drastically alter the appearance of a scruffy WallStreet. You can find a tutorial on how to make your WallStreet look like this. Sick of hauling an external floppy drive around just to get data off your clamshell iBook? What if you could just burn your data on CDs instead? Wegener Media can do the install and upgrade of your iBook. It looks a little different, but you get all the functionality of your iBook plus the capability of a CD-RW. Simply ship your machine in, and Wegener Media will install the drive, set it up, and ship it back to you within 24 hours. They can also upgrade RAM & hard drives for you at the same time to save shipping costs. Note that if you have a DVD iBook, you will lose DVD capability in this upgrade. 4x4x CD-RW version complete installation, with 3 day airborne shipping of your iBook, installation, testing, software installation, and return shipping. $210. Complete installation, with overnight airborne shipping of your iBook, installation, testing, software installation, and return shipping. When you purchase this, you will receive an airbill and shipping instructions by email, which you can use for immediate shipment. $235. BatteryStatsX is a little utility that gathers detailed information about your 'Book's battery. The program only runs on a PowerBook or iBook in Mac OS X 10.1 and higher. BatteryStatsX works by using the shell command ioreg. ioreg provides information about various parts of the computer. New background client logs data every x seconds, completely independent of the application. The MacResQ Mini AC Adapter's slim and light design makes it easy and convenient to carry around with your PowerBook G4 or iBook. The package includes a Velcro strap to safely bind the cord together. 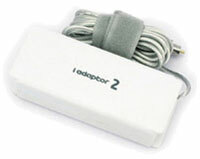 The exterior is specifically designed so that you can simply wrap the cord around the adapter. Small enough to carry with you and affordable enough to buy for multiple locations. Do you want to have some more protection of your data and machine while your away from your desk? Is your PowerBook often sitting on your desk unobserved and virtually anybody could get access to it? Then you need ScreenLock. ScreenLock works simply: Every time your computer wakes from sleep, it denies any access to your data and applications unless you enter your password. It's this very same functionality that came with Mac OS 9 on portable Macs. The German Apple news site MacGadget reported last week that Apple cut the price on the 17" PowerBook G4 in Germany, Austria, and the Switzerland. In Germany, the price of the 17" PowerBook G4 was cut by 300 to 3710.84 Euro. In Austria, the new price for the 17" PowerBook G4 is 3838.80 Euro (formerly 4198.80 Euro). In Switzerland, Apple cut the price by 200 Franken to 5199 Franken. The price cut leads to the expectation that Apple is clearing inventory in preparation for new PowerBook models. "Owners of Apple's 12in PowerBook G4 will at last be able to bust the 640 MB memory limit on their machines without breaking the bank. "US Mac specialist Trans International today launched a 1 GB PC2100 SO-DIMM compatible with the notebook. With the 128 MB soldered on to the PowerBook's motherboard, users can now equip themselves with just over 1.1 GB of RAM." With the previous 512 MB memory upgrades, the 12" PowerBook was limited to a maximum of 640 MB. TransIntl's 1 GB RAM upgrade sells for $499, which seems pricey when you consider that 512 MB SO-DIMM currently cost about $100, but if you need the extra memory capacity, it's available. WiebeTech has announced price reductions of up to 37% on many of its most popular storage products. The amount of the reductions vary by product. For example, the popular MicroGB+ pocket drive with a 40 GB, 5400 RPM, 8 MB cache drive has been reduced $40, from $269.95 to $229.95. At the top end of the scale, the price of the 1.2 Terabyte Quad BayDock FireWire storage system has been cut from $3995 to $2539. More than 35 different product configurations have been permanently reduced in price. A listing of price reductions can be found on the WiebeTech website by clicking on the "Prices" tab. All price changes are noted there. "This price reduction comes as a result of the strong response to our recent Summer Sale," said James Wiebe, CEO of WiebeTech. "Consumers are clearly telling us they will buy our product in ever increasing volumes. We are responding to the demand spike by providing substantially greater value for the price. "We've also simplified our product line by culling out some of our product configurations," continued Wiebe. "In addition, we are bundling all of our BayDocks storage systems with an extra tray insert. This allows users of the removable BayDocks to always have the ability to store or swap an extra drive, which is a common requirement." Dealers may purchase WiebeTech products from WiebeTech's distributor In the U.S. and Canada, Dr. Bott, or from dealers. All configurations are in stock and available directly from WiebeTech. Canadian resellers may purchase products from EMJ. ProClip USA offers automotive mounts for the Apple iPod to securely hold the portable digital music players in cars, trucks and SUVs. "Securely mounting accessories like the Apple iPod, without damaging a car or truck's interior, is what we do best," says Bjorn Spilling, president of ProClip USA. "We offer mounts and holders that are custom designed for virtually every car make and model and for every communication accessory in the marketplace." ProClip mounting brackets are clip-on devices that attach to the car or truck's dashboard or console and can be self-installed in seconds. 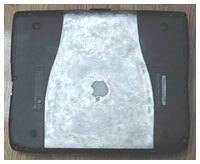 Once the bracket is in place, a custom designed holder is attached to provide a perfect fit for the Apple iPod. ProClip products are available for purchase on the Internet from ProClip USA or by calling toll-free 800-296-3212 and through a number of wireless communication retail stores and outlets. A trial version is available, and a license can be purchased at an introductory $15.95 for a 2-license Starter Pak. Fuel cells that can run laptops for 10 hours or more without plug power have captured the imagination of computer junkies. But first, backers must prove that they are as safe to fly with as a cigarette lighter or a duty-free bottle of vodka. Japanese companies are pushing ahead with prototypes of miniaturized fuel cell technology that use methanol to create power, even though experts say limited-life batteries are here to stay for several more years. Fuel cell-powered laptop prototypes have been developed by Toshiba (6502.T) and NEC (6701.T), who plan to start selling them as full-fledged products next year. Casio (6952.T), Sony (6758.T) and Hitachi (6501.T) and Samsung (00830.KS) of Korea are also working on micro fuel cell technology."